Why Should You Choose Asphalt Instead Of Concrete? To make concrete, one needs sand, crushed rock, cement, and water. All these components will be combined to form one rigid and tough solid material. The cement acts as the chief binder that holds all components together forming a stiff material that cannot easily crack or break especially when placed on uneven grounds. To make asphalt, you need the same materials like the ones used in making concrete but the binder in asphalt is a substance called bitumen. This is a dark, sticky substance that is extracted from crude oil. Asphalt is normally applied on rough aggregates to make a smooth road or cover on it. Once it is applied, a thermal roller passes over it to smoothen and flatten it. Asphalt will then use the surrounding air to withstand any kind of vehicle force applied to it. Unlike concrete, asphalt is tough and it has some level of flexibility to accommodate any uneven surfaces. It does not crack or break like concrete does when subjected to such conditions. Unlike in concrete pavements that can severely break and require intense repair, asphalt does not undergo any serious damage. Its damages are small and they do not require a lot of effort or resources to rectify. A single person can repair asphalt damage as compared to concrete repairs that require sand, small stones, and a lot of manpower. Even in construction, asphalt does not take long. As long as you have a perfect aggregate foundation, you can simply install asphalt and your road will be ready to use once asphalt dries up. Concrete needs several days and it needs to be avoided until it dries up completely. Roads made from concrete are more prone to cracks because the surfaces are so rigid and stiff. This is more common especially when more sand and stones are used in proportion to cement that acts as a binder. Asphalt can withstand heavy forces even trucks because once its contents dry up, it becomes strong. To conclude, asphalt is not only robust but it is also easy to maintain when used in pavements. Unlike in concrete pavements where you will see small holes and cracks after some time, asphalt is tougher and it will remain smooth and in excellent condition. It is because of these benefits that many people have made their walkways, roads and parking slots using asphalt. 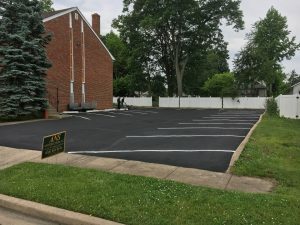 Besides the quality of asphalt, it is always better to work with reliable concrete contractors in Gloucester County to make sure high quality and best construction practices are used to make your pavements last longer. ANS CONSTRUCTION, LLC is licensed and insured in New Jersey and Philadelphia. We serve Gloucester County, Camden County and the City of Philadelphia.